A Different Kind of Coaching BookFacilitative Coaching is a dynamic resource that offers coaches, leaders, facilitators, consultants, and therapists a guide for expanding their repertoire and helping their clients achieve lasting results. It challenges coaches to employ a full range of creative methods for working with the whole brain and helping themselves and their clients get unstuck when facing obstacles. 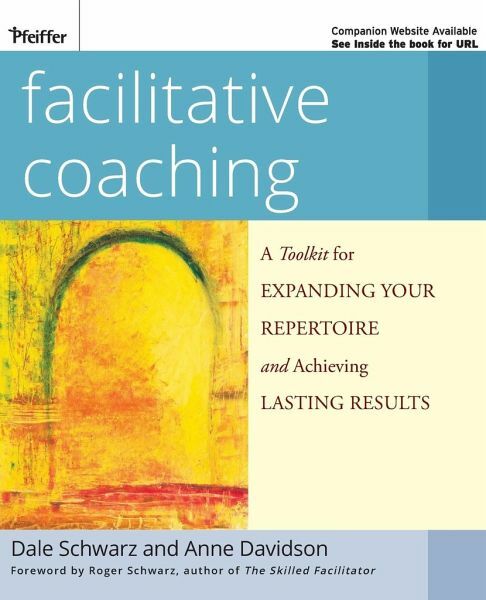 Facilitative Coaching and the companion CD include more than seventy exercises, along with guidelines, tips, and tools for putting them into action. All the exercises can be adapted to a variety of situations and are designed for both the professional development of coaches and use with clients. In addition to myriad hands-on tools, the book and CD include illustrative client stories, creations, and examples of results that are sure to spark creativity. 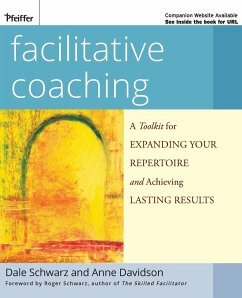 All the Facilitative Coaching methods have been tested by the authors during their more than fifty years of combined coaching, consulting, training, and facilitation experience. Their work is grounded in an in-depth coaching model that they developed and teach in their Facilitative Coach workshops. ?It is based on the highly successful Skilled Facilitator approach developed by best-selling author Roger Schwarz. This comprehensive resource includes the information and tools needed to become a collaborative coach who fully engages clients in achieving creative, purposeful action toward their deepest dreams and desires. Dale Schwarz is a personal and professional coach, art therapist, and workshop leader. ?For over thirty years, she has guided individuals to fully use their gifts and talents to transform their lives. In addition, she helps coaches expand their repertoire and skills and provides organization development consulting to both public and private sector clients. Dale is the co-founding director of the Center for Creative Consciousness and an associate with Roger Schwarz & Associates.Anne Davidson specializes in leadership development, facilitator training, and long-term organizational and community change projects. Anne brings twenty-five years of experience to her international work with executives, management groups, work teams, and nonprofit and local government boards. She coaches individuals in creative development and in applying The Facilitative Leader approach. Anne is a consultant with Roger Schwarz & Associates and co-author of The Skilled Facilitator Fieldbook. or Colorful Language. Adapt What You Know. Remain Curious and Playful. Co-Create with Clients and Colleagues. CHAPTER FOURTEEN: COMBINING MODALITIES FOR SUCCESSFUL COACHING. Establishing a Relationship to Support Your Interventions. Combining Modalities. Guidelines for Choosing Modalities. Catalysts for Suggesting a Modality. A Three-Course Meal Plus Dessert: Combining Multiple Modalities Over Time. Closing the Coaching Engagement. Putting It All Together: Practice Scenarios for Choosing and Combining Modalities. APPENDICES: THE FACILITATIVE COACH FOUNDATION MODELS. Appendix A. The Facilitative Coach Model. Appendix B. The Unilateral Control and Mutual Learning Models. Appendix C. Ground Rules for Effective Groups. Appendix D. The Diagnosis-Intervention Cycle. Appendix E. The Life Learning (Creative/Survival) Model? Appendix F. The Drama Triangle. RESOURCES. Resources for Learning More. Suggested Art Materials. Suggestions for Addressing Chapter Fourteen Practice Scenarios. REFERENCES. Index. ABOUT THE AUTHORS.